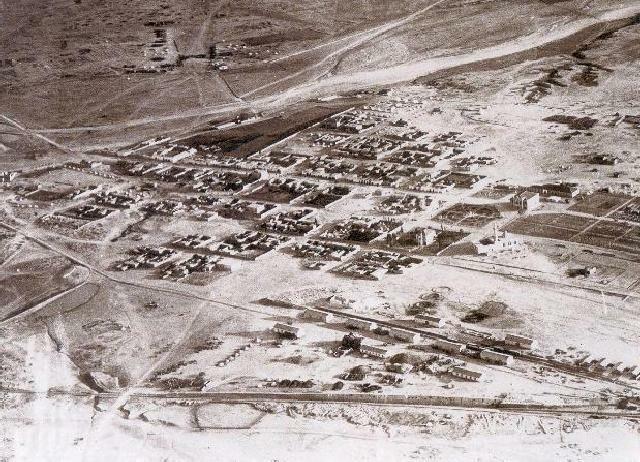 Aerial view of Beersheba, 1917. Beersheba, the most famous mounted charge involving Australians, was carried out by light horsemen against Turkish fixed defences in Palestine on 31 October 1917. After two previous British failures that year to take the strategic coastal city of Gaza (q.v. ), preparations were made for a third attempt by the newly appointed commander-in-chief of the Egyptian Expeditionary Force, General Sir Edmund Allenby. The plan he devised entailed turning the left flank of the Turkish defensive line which rested on Beersheba, a small town situated in the desert about 43 kilometres south-east of Gaza. 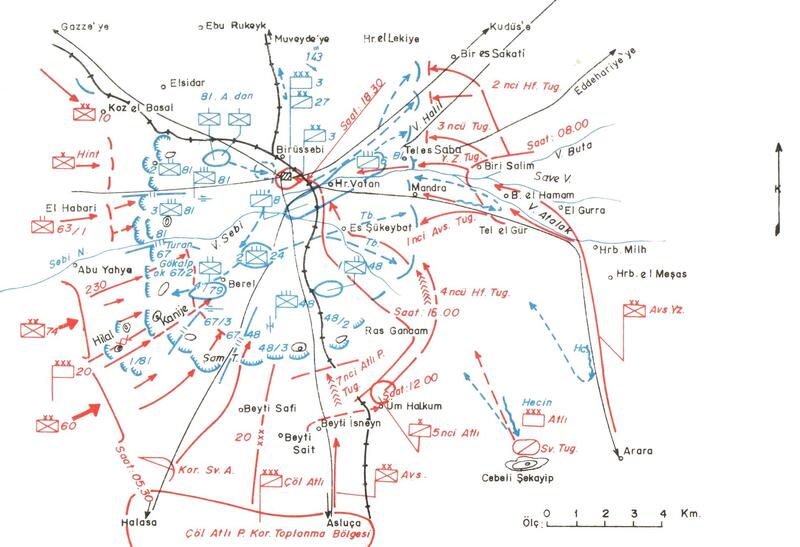 To this end British infantry corps were to make frontal attacks against both ends of the Turkish line simultaneously, while the Desert Mounted Corps (commanded by Australian Lieut.General Harry Chauvel) made a wide circling movement to approach Beersheba in the rear, from the east and north. On 27 October the 15,000 Australian and New Zealand horsemen in the two divisions of the Desert Mounted Corps available to Chauvel embarked on a series of night marches which took them east, to concentration areas at the water-points of Khalasa and Asluj more than ten kilometres south of Beersheba. Three days later they were positioned in readiness for the 25,000 men of the British 20th Corps to begin their assault on Beersheba from the west and south-west at dawn on the 31st. Chauvel's first assigned objective was to capture enemy positions beside the Hebron road behind the town, thereby completing its encirclement. Stubborn resistance was overcome to take these posts by 3 p.m., by which stage the seizure of the town itself was becoming critical because of the attackers' need for water. With only two hours remaining before nightfall Chauvel decided to send in Brig.General William Grant's 4th Light horse Brigade, which so far had been hardly involved in the day's fighting: "Put Grant straight at it." was his terse instruction. Although the conventional use of light horse units was as mounted infantry only, the urgency of the situation prompted Grant to adopt the hazardous cavalry-style tactic of an open charge. Concealed behind a ridge some eight kilometres south-cast of' the objective, the two leading regiments of Grant's brigade - the 4th from Victoria on the right, and the 12th from New South Wales on the left - were drawn up in three lines 300-500 metres apart, with five metres spacing between men. As neither unit was equipped with the normal shock action cavalry weapons of lance or sabre, the troops were ordered to carry their long bayonets in their hands. 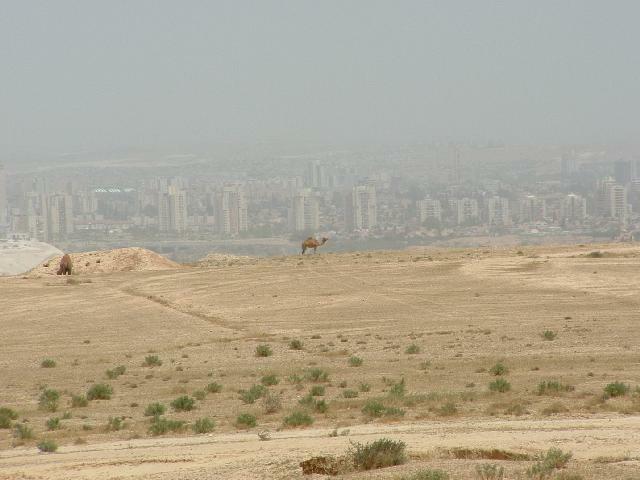 Beersheba as seen from the Turkish support trenches behind Hill 1069. The British were ordered to stop here at 1 p.m. despite nothing preventing them from taking the town. At 4.30 p.m., just on sunset, the attack force moved off at the trot with Grant initially at its head. The 400-500 horsemen were already at the gallop when they crested the ridge and came into Turkish view, but the speed and momentum of their charge quickly carried them through the curtain of fire from enemy field-guns, machine-guns and rifles. 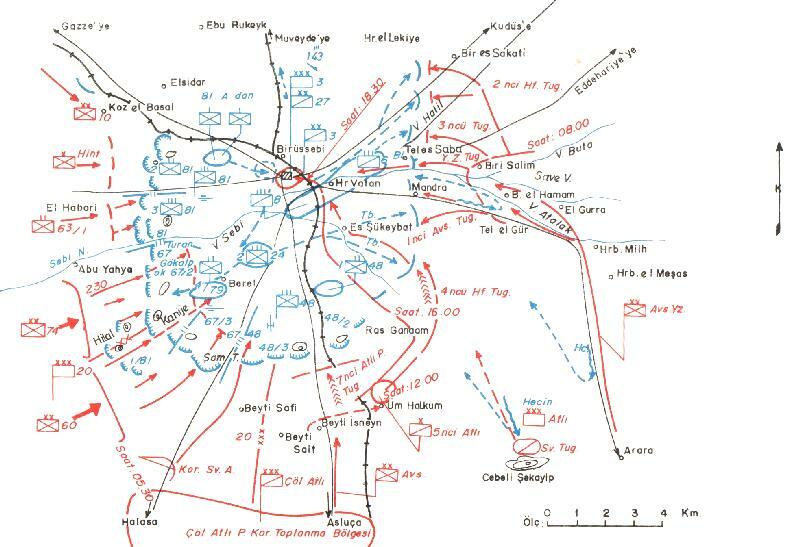 The Turkish positions - unprotected by wire - were breached without difficulty by the leading ranks, who leapt their horses over the trenches before dismounting and engaging the defenders in brutal hand to hand combat. Two squadrons of the 12th Regiment raced on into the town, in time to prevent the destruction of all but two of seventeen wells by the fleeing Turks. Within an hour of the charge's commencement all resistance collapsed, as those defenders, who could made a rush for the safety of hills to the north and north-west. Nine guns and more than 1,000 prisoners were taken from the reinforced 27th Division occupying the town, and the commander of the Turkish 3rd Corps himself barely escaped capture. All this at a cost to the Australians of only 31 killed and 36 wounded. 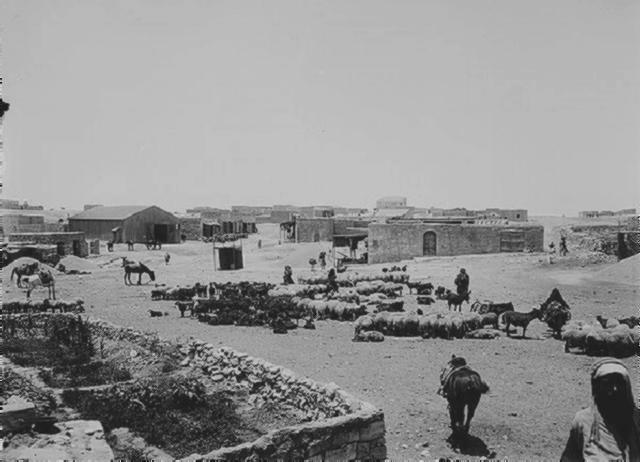 The dramatic fall of Beersheba opened the way for the whole Turkish defensive line to be outflanked and rolled up from east to west. After further heavy fighting, the Turks abandoned Gaza on 6 November and began a northerly retreat deeper into Palestine. The charge was a truly memorable and heroic feat of arms, fully deserving of the epic status it has subsequently achieved. The absences of' the sort of casualties which might have been expected from an assault across nearly 6,000 metres of open ground swept by automatic weapons owed much to the speed of' the unexpected attack. This was later discovered to have caused many Turks to forget to make range adjustments on their weapon sights, with the result that during the final stages of the charge much of the defenders' fire had passed harmlessly over the Australians' heads. 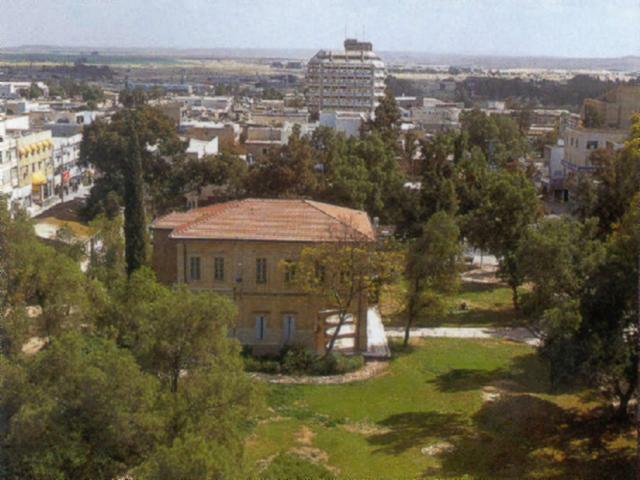 The scene from Government House to the field (the green patch, top left) where the famous Charge occurred. Extracted from the book produced by Chris Coulthard-Clark, Where Australians Fought - The Encyclopaedia of Australia's Battles, Allen and Unwin, Sydney, 1998, pp. 134-136. H.S. Gullett, (1944), The Australian Imperial Force in Sinai and Palestine, Sydney: Angus & Robertson. A.J. Hill, (1978), Chauvel of the Light Horse, Carlton, Vic. : Melbourne University Press.